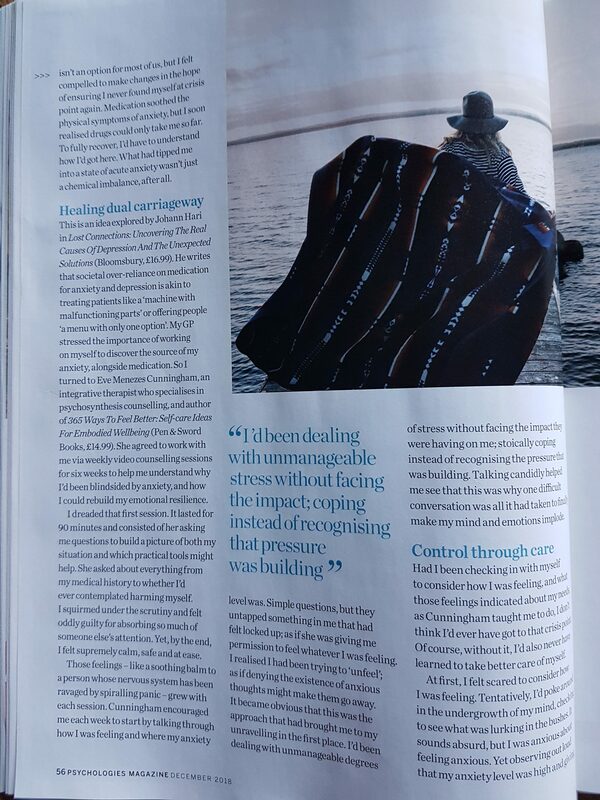 Wellbeing Wednesday: Does the Idea of Counselling Scare You? 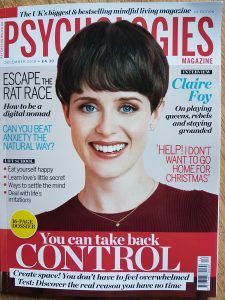 Am delighted that my work is featured in another Psychologies (December 2018) cover story. In Can You Beat Anxiety the Natural Way? 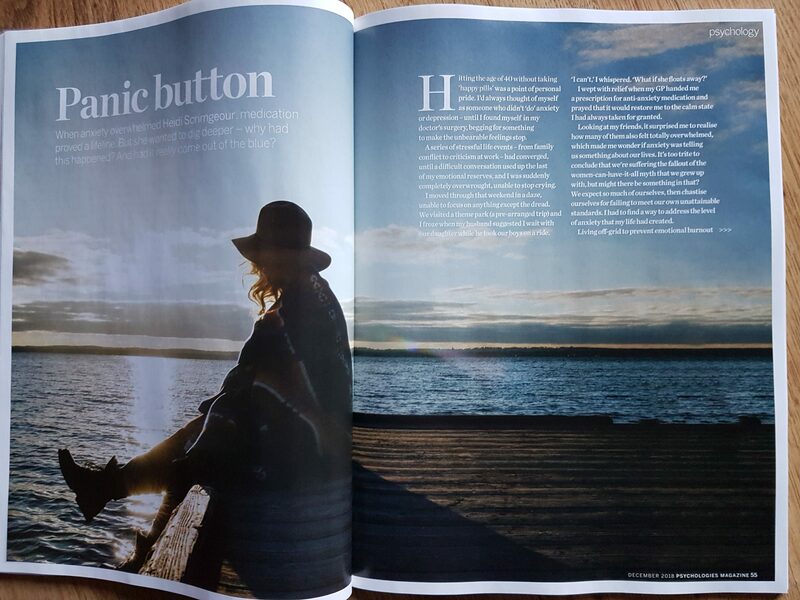 (see p54 for the full four page spread), Panic Button, journalist Heidi Scrimgeour shares part of her journey, having online counselling with me to help her manage anxiety. 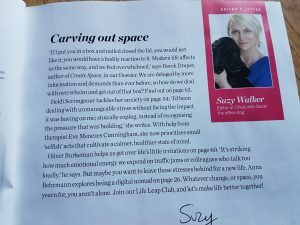 One of my specialisms is anxiety (READ MORE…) and yet it’s totally normal for new clients to feel anxious when we first meet online or in person. Seeking support is a huge step. I remember how scared I was when I had therapy when I was much younger. I scuttled away too quickly to really benefit each time. The thing that scared me most about training as a psychosynthesis counsellor was the idea of having ongoing training therapy. But once I committed to it (and I highly recommend researching to find a therapist you feel comfortable enough talking to), it was transformative. I also know that it’s there any time I need to dip back in and out for the rest of my life. Now, for the first time, as well as inviting you to explore my site to see how I work (READ MORE…), services I offer (READ MORE…), see what clients have said in the past (READ MORE…), find out more about my specialisms (READ MORE…) and access a plethora of free resources you can use to help yourself (READ MORE…), you can get a sense of what it’s like to have online counselling with me by reading this feature. 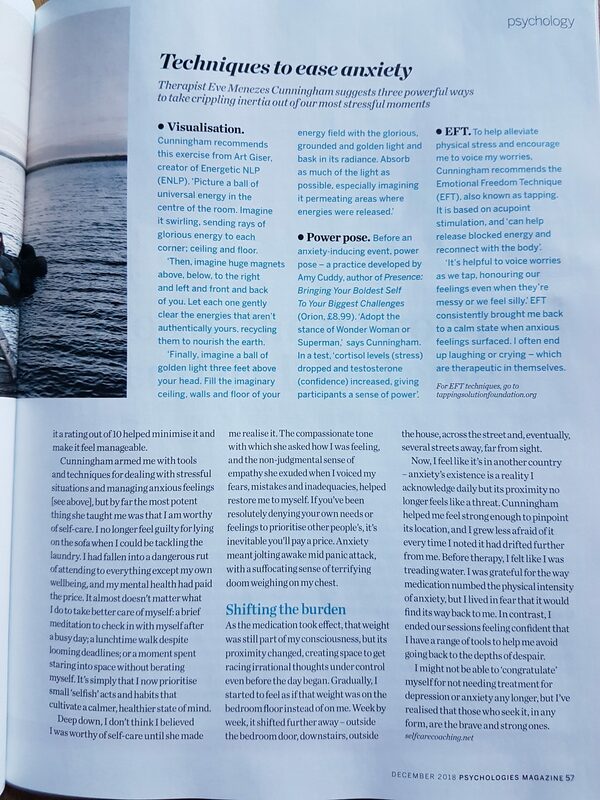 You can find out more about the EFT mentioned in the box out HERE. 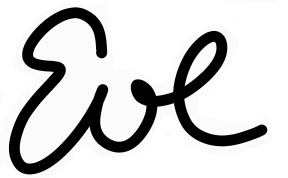 And Energetic NLP (ENLP) HERE. Heidi only had six online sessions with me but was incredibly motivated (as you’ll see from her feature) and worked on herself between sessions. Whether you work with me or someone else, while counselling can be powerful, it’s usually only 60 minutes (sometimes 50) a week. What you do in between sessions has an enormous impact not just on the progress we make together but how embedded in your routine the self-care practices become and how well you sustain your gains afterwards. Have you got any counselling or therapy horror stories? Does the idea of shining a light on your more shadowy aspects fill you with dread? While we’re talking about Hallowe’en, I’ll scare myself (again) by asking if maybe it’s not your shadowy aspects but your light that scares you? 14 plus years into this kind of work and I’m still torn when something wonderful (like Heidi’s fantabulous feature) happens. Part of me wants to share it, to reach more people and another part still has to watch my self-talk and be gentle with myself as I do so. Makes me smile to think how I thought therapy would fix me. Still, it helped me start learning that gentleness and self-care and support and I absolutely adore being able to support others with my practice as it evolves. I hope, this Hallowe’en, you’ll consider accessing the support you deserve to move past whatever might be holding you back. Remember, you’re so much more than whatever you’ve survived or are going through. I’d love to support you in learning to heal your own mind, body, heart and soul if you would like to work with me. If so, take a look around my site and get in touch (HERE) to book your free telephone consultation. Next Post Can I Talk About Crystals on the Radio (BBC Birmingham) Without Sounding Too Woo Woo?